I’m going to discuss something that bothers me to no end. His name is Grandmaster Henson, and he is my dog. Let me ‘splain it like this. He has a little soft red toy that he loves to play with. It’s a cloth ball, and it says “Coca-Cola” on it. He will go anywhere for this ball. It is like pure cocaine to him, which is ironic considering Coca-Cola’s sordid history of ingredients. Maybe they just put their extra smack in their plush toys these days. Who’s to say? Anyhow, he takes this toy and chews it, yes, but he does more than that. He likes to chew it near things. Things like my foot. Or my arm. Or my ear (if he dares). But that’s not the worst part. He most enjoys chewing it near any low-set shelf, such as our entertainment system, the bookshelf near my computer desk, or the little free-standing medicine cabinet in our bathroom upstairs. This matters for one reason. The ball fits under these shelves. Henson’s head does not. 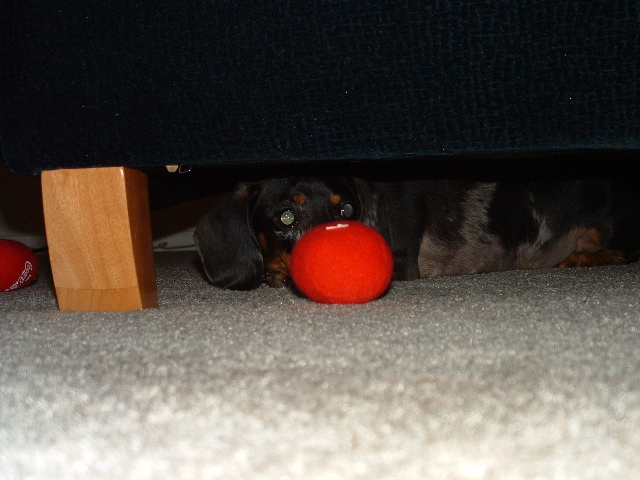 So when he pushes the ball around with his nose as any ball-loving dog is known to do, he inevitably pushes the darn thing under the shelf, and while stabbing at it with his nose in an attempt to bite it and pull it back out, pushes it far beyond the reach of his huge schnoz. Then, the nearly inaudible whining begins. Over a period of several minutes, even as much as an hour, the whining crescendos slowly. Henson must have a hit from that ball, and he needs it pronto. Just one more chew, then he’ll be fine. He’ll pay me back later, I know he’s good for it, etc. It’s really a test. I have to see how long I can stand it before I’m left with the choice of getting the ball or killing the dog. Then I get the ball and give it to him, and the cycle repeats. 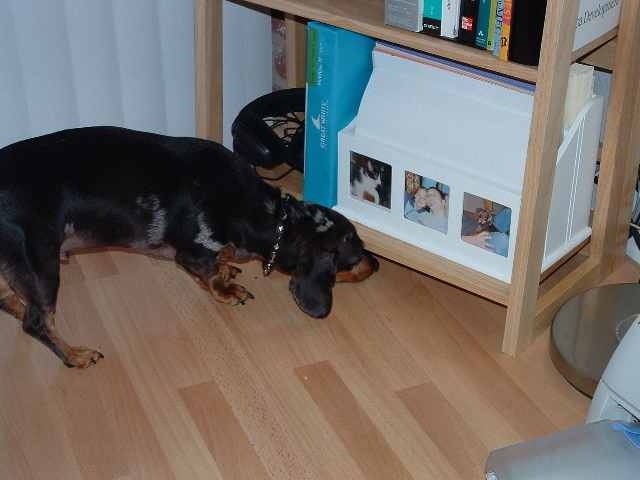 Chew, chew, chew… push under shelf… whine, whine, whine, get ball back…. chew, chew, chew. You see how it is. Have pity on me, kind reader! Just one question… am I being an enabler? UPDATE: [12 am] Proof of his transgressions! UPDATE: [12:10 am] Stephanie sent in this disturbing image of Henson caught in the act. Support is flowing in from all corners of the living room! Perhaps you should rename the title of your web page to “My Blodog”, considering the amount of cyber space devoted to him. Oh! And I was wondering… I Henson is Grandmaster Henson… that would make you grandmaster Master! -or-… grandmassuh massuh -or- …..grand(slavedriving) massuh massuh -or-…. grandmaster pooper scooper…right? Ugh. El Grandmaster loves to chew things on me as well, and his annoying is truly annoying/heart rending. Grrrr. Sic Five on ’em or something. A dogged pursuit would be curtailed (get it?) if a few hard back books were placed under shelves. Ladies and gentlemen: my mom. Brilliant! I never thought of that. I was actually considering constructing a cardboard barrier and taping it in there, etc., but it was far too complex. Good job seeing the simple solution, mom! Except that it’s ugly when you have piles of books under all of your furniture. But…I have to admit that it’s better than Josh’s cardboard and tape idea. I have another solution all together…take Henson’s ball from him. The only problem is that he’s had the shakes for awhile and keeps digging under the couch cushions (he thinks his ball just has to be there someplace). I’m afraid he’ll commit some kind of felony just to get one more hit of that ball. Just one more hit…. Hmmmm, how to satisy you guys and Henson (one more hit… hehe, I had no idea he was such an addict). I think Steph’s is the way to, unless you want to block off ALL of your furniture. Unless, Grandmaster keeps whining and looking for the ball 2 weeks from now- then it’d be like he just had the ball, so he might as well still have it. Perhaps switch to a Pepsi ball… or better yet, a 7-UP ball… or even better, a water balloon! That could be fun! (Stay away from the bread balls. Bread = Death) For moral support, contact MAOF or DOAF (Mother (or Fathers) Against Oral Fixations). I’ve also heard mixing a stonger drug, such as Beggin’ Strips, with a a substance that inhibits addiction, like Orange Juice, cancels the effects of withdrawl. Many members of BA have reported to have licked the habit. Are you an chew toy addict? I play with it more than I intend to. I avoid people and/or places that do not condone my usage. I spend more money on chew toys than I can afford. I wonder why some people don’t use. I have tried substituting one toy for another thinking “one” particular toy was my problem. I have neglected my responsibilities due to my using. My family and friends complain about my using. I use because my family drives me crazy. I have conned doctors for “legal” chew toys, telling myself that it’s okay to use them because they are legal. I use one toy to offset the effects of another. I have been in trouble with friends, family, school, or my job because of my using. I have been in trouble with the law as a result of my using. I have empty, chewed-up toys lying around the house. I play with toys that I don’t prefer. I do things while under the influence that I would not ordinarily do while straight. The good times are gone from my using. I think I must be high to have a good time. I have questioned my own sanity. I have had a blackout, where I wake up the next morning and don’t remember what happened the night before. I lie about what or how much I use. I use chew toys to feel more comfortable with people. I have tried to control my use. I have tried to cut down my use. I have tried to stop using. I am ashamed of my using. I think I might have a toy problem. I want to stop but I can’t do it alone. This might be barking up the wrong tree but another option would be to raise all your furniture off the floor a few inches so that the Grandmaster can get his fix. Hey, its just a thought. Put a small chain on the ball, and attach it to his leash. That way, if he backs up, he will get his ball back. Bingo! Self-service ball retrieval.